Harnessing The World's 50 Best Bars Academy of global experts, we chose the member that offered the most authoratitive views on the given subject. When it came to rum, we couldn't look beyond the global rum ambassador. So, over to Ian Burrell for his take on the world's best rum bars. The staff should have a decent knowledge of the rums they stock and should be able to recommend a rum drink for the most expert rum aficionado or any rum novice who may pass through their doors. I would also expect there to be at least 50 rums on offer, and I don’t mean 50 different flavours or spiced rums. The style of rums that should be on offer are English, Spanish, French, Brazilian, an over-proofed high strength, a 100% pot stilled rum, a several-island blend and an ultra-premium rum that can compete (in packaging) with premium vodkas. And that is just the white rums. In the gold rum category I would stock a Jamaican style, Guyanese, French, Spanish, a sweeter central or South American rum (for after dinner), a Demerara rum, a Navy rum and one very expensive rum just to let my customers know that the rums are not only for mixing with coke. So that’s 16 rums for starters. Not a bad selection for a basic bar, although some of my favourite bars around the world stock at least 80 rums on their shelves. These bars are a testament to the creators’ passion for and love of rum as a spirit that is more than just an offering to quench the thirst – it is a spirit that is a lifestyle of the past, present and of the future. If you ever find yourself in sunny San Francisco (well it is sunny in the summer) and you’re in need of a great rum cocktail, then there is only one bar to head to. Smugglers Cove not only stocks more than 200 rums, it also combines classic Tiki cocktails with punches, Prohibition era drinks, traditional drinks from the Caribbean and, of course, modern creations. Owner Martin Cates opened the doors in 2009 and since then has won many awards and accolades for his treasure of a bar. 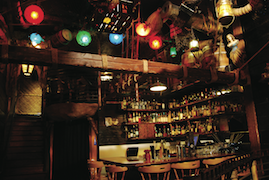 This rum bar/nightclub is as famous for its high-profile clientele as it is known for its Tiki décor and rums. Since its opening in 2006, the club has attracted media attention as a favourite haunt of Princes William and Harry. 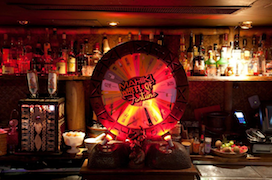 Just like the great Tiki bars of the 1950s and 60s, which attracted the rich and famous, Mahiki has no windows, is loud with music and energy and serves some of the most exotic rum cocktails - inspired by the bartenders such as Don The Beachcomber and Trader Vic Bergeron. With more than 200 rums on the back bar you are guaranteed a great night. One of my great ‘spiritual friends’, Dale DeGroff once said: “I don’t go to bars for a drink, I go to see bartenders.” This is so true. You can sometimes find a character behind a bar who, no matter where they worked, you would gravitate towards them because of their energy. Lyndon Higginson (formerly of Keko Moku) is one of those bartenders. 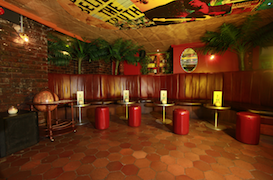 In 2011 he set up Manchester’s newest Tiki rum bar, which has immediately become one of the must go-to bars in the UK. Typically Tiki, it stocks well over 100 rums and even has a pet goldfish-eating Piranha to amuse you while you sip on a Painkiller or Zombie.